Received September 10, 2018; Revised September 13, 2018; Accepted September 17, 2018. Transparent TiO2 nanotube arrays are successfully prepared by a two-step approach involving electrochemical anodization and RF magnetron sputtering. First, a Ti film is deposited on an FTO substrate by RF magnetron sputtering at room temperature. The morphologies of the Ti film are controlled by the working distance, Ar flow, and DC power. Second, an anodization treatment is electrochemically performed for the formation of nanotube arrays from the deposited Ti film, followed by post-annealing treatment in air for the formation of TiO2 crystallization. The back side of the crystallized TiO2 nanotube arrays is illuminated with solar light to characterize the photoelectrochemical reaction, and their photoelectrochemical properties are investigated. This work provides information on application of a thin film deposited by RF sputtering in the field of photoelectrochemical water splitting. The chemical fuels from solar light are some of the most promising resources for renewable and sustainable energy . Artificial photosynthesis, which mimics natural photosynthesis, can convert solar energy to valuable chemicals such as hydrogen, formic acid, and alcohol . Fundamental understanding of such a consolidating process is closely related to the efficiency of solar fuels; therefore, many efforts have been dedicated to making experimental efficiency reach the theoretical efficiency . Among artificial photosynthesis, the water splitting reaction is a fundamental reaction where reduction/oxidation occur simultaneously. As a basic reaction, a water splitting reaction is one of the easiest ways to produce hydrogen and oxygen from solar energy. In particular, as a storable, transportable fuel and feedstock, hydrogen is one of the most important resources in the chemical industry. Since the Fujishima-Honda effect was reported in 1972, photocatalytic (PC) and photoelectrochemical (PEC) water splitting has been achieved for solar light-driven hydrogen evolution. Rapid developments have been accomplished through PC powder suspension systems and PEC photoelectrode systems. Increased efficiency of PC reactions based on powder suspension system has been obtained using designed nanostructured photocatalysts because their high surface area and size-dependent properties can induce enhanced photocatalytic properties . Cation/anion doping strategies can also increase efficiency . Compared with PC systems, morphology structuring, from nano- to micro dimensions, has received great attention in PEC systems. Dimension-manipulation strategies have been successfully demonstrated using wires, tubes, and rod-shaped nanomaterials to enhance PEC characteristics [6–8]. Since the introduction of TiO2 photocatalyst for hydrogen evolution by Honda’s group, powder-type TiO2 has shown some limitations in application as a thin film electrode. The randomly arranged nanoparticle systems limit their PEC performances because of slow electron diffusion in the process of thin film preparation. 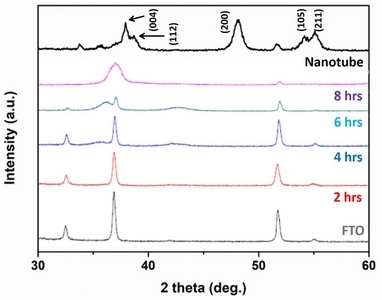 Recently, P. Yang’s group reported that the electron transport rate of ZnO nanowire arrays was increased through the one-dimensional (1D) nanowire geometry . Research by A. J. Frank’s group indicates that the photoconversion efficiency of a photoanode was considerably increased because of a slower recombination rate induced by the 1D morphology . C. A. Grimes’ group suggested the application of 1D TiO2 nanotubes in the field of dye-sensitized solar cells for enhanced photovoltaic performance . These reports indicate that vertically oriented 1D structures exhibit an extremely improved energy conversion efficiency resulting from their direct electron and ion diffusion pathways between interfaces. This trend reveals that 1D TiO2 nanotubes in PEC allow higher photoconversion efficiencies, resulting in significant improvement. The advantages of such 1D nanostructures have led to fabrication of wire, tube, and rod-shaped semiconductor photocatalysts for the improvement of photoconversion efficiency in PEC. To date, TiO2 nanotube arrays have been achieved by anodization of Ti metal foil . Because of the opaque Ti substrate, the front side of Ti nanotubes need to be illuminated through the electrolyte for photon absorption in PEC systems. Back illumination is more favorable than front illumination, considering the charge separation and mobility of a typical n-type semiconductor. Such methodology for nanotubes fabricated by anodization of Ti metal foil limits the achievement of their simulated PEC performance because of their inherent disadvantages. Herein, we demonstrate n-type semiconducting TiO2 nanotube arrays on transparent fluorine-doped tin oxide (FTO) substrates. The TiO2 nanotube arrays are successfully prepared by electrochemical anodization and RF magnetron sputtering. This work demonstrates application of a metal thin film deposited by RF sputtering in the field of photoelectrochemical water splitting. Cleaning of FTO substrates (SnO2:F, 8 ohm sq−1. Pilkington) was achieved with sequential ultrasonication in acetone, ethanol, and distilled water for 3 min each, followed by drying with a nitrogen stream. A Ti film was deposited on an FTO substrate using a Ti target (99.999 %) by RF magnetron sputtering . The deposition by RF sputtering was carried out under a base pressure of 8.0 × 10−6 Torr with a working pressure of 3.0 × 10−3 Torr, and RF DC power and Ar gas flow was varied to control the morphology of the film. 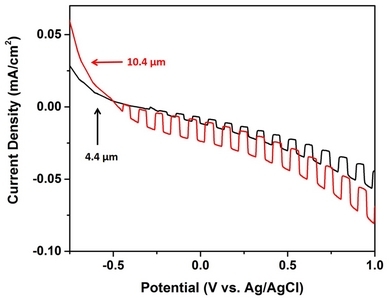 The deposited Ti thin films on FTO substrates were electrochemically anodized in an electrolytic solution of ethylene glycol (C8H18O5, Sigma Aldrich) containing 0.135 M ammonium fluoride (99 % NH4F, Sigma Aldrich) and 1.75 vol% distilled water at 45 V. The anodized sample were annealed at 450 °C for 3 h in air for crystallization. The morphology of samples was observed using a scanning electron microscope (SEM, JEOL). A Rigaku D’Max 2200 V (Cu Kα radiation, λ = 1.5406 Å) wide-angle X-ray diffraction system was employed to determine the crystallinity and structure of the prepared samples. Current–voltage measurements were recorded using a PL-9 (KST-P1) with a three-electrode system using a Pt wire as a counter electrode, Ag/AgCl as a reference electrode, and NaOH solution (0.1 M) as an electrolyte. Current-voltage measurements were performed under 1 sun illumination (AM 1.5, 100 mW/cm2) with a Newport (USA) solar simulator (300 W Xe source) and a Keithley 2400 source meter. The procedure for fabricating TiO2 nanotube arrays on transparent FTO substrates is illustrated in Fig. 1. First, RF magnetron sputtering for Ti film deposition was achieved on FTO substrates at room temperature. As shown in Fig. 1(a), the deposition of the Ti film was controlled by three factors: working distance between the FTO substrate and target; Ar flow, adjusted by a digital mass flow controller (MFC); and DC power. Second, the deposited Ti film on the FTO substrate was electrochemically anodized to form nanotube arrays, as shown in Fig. 1(d). Finally, the as-anodized sample was heat-treated in air to produce the anatase phase of TiO2 crystallization. Figure 2 shows microscopic observation of a typically deposited Ti film on an FTO substrate. The deposition conditions for RF sputtering were controlled by adjusting the working distance, Ar flow, and DC power. Figure 2(a)-(c) presents typical top-view SEM images of Ti films deposited with different working distances in the range from 1.5 to 2.0 cm, with the other conditions fixed at 40.0 standard cubic centimeters per minute (sccm) of Ar flow and 70 W of DC power. Spherical particles with sizes of approximately 2–3 μm were formed, resulting in a high roughness for the Ti film deposited with a working distance of 1.5 cm, as shown in Fig. 2(a). This result indicates that the Ti film was composed of aggregated spherical Ti particles. The SEM image of the Ti film deposited with a working distance of 2.0 cm shows a flatter and more dense film than those deposited with working distances of 1.8 and 1.5 cm, as shown in Fig. 2(c). Figures 2(d) and 2(e) show SEM images of Ti films with different Ar flow conditions. With a working distance of 2.0 cm and 70 W DC power, Ti films were deposited on FTO substrates with 42.5 and 45.0 sccm Ar flows, controlled by an MFC. When deposited with 42.5 sccm of Ar flow, the morphology of the Ti film was rough, like that of the Ti film deposited under a short working distance, as shown in Fig. 2(d). For deposition with 45.0 sccm, the roughness of the Ti film increased, as shown in Fig. 2(e). This result indicates that a higher Ar flow produces Ti films with larger particles. Figures 2(f)–(h) show top-view images of Ti films deposited with DC powers of 75, 80, and 90W, respectively, at a working distance of 2.0 cm and 40 sccm of Ar. The Ti film deposited with 75 W of DC power shows a smooth surface, as shown in Fig. 2(f). When the DC power increased to 80W, smaller particles were formed in the deposited Ti film, as seen in Fig. 2(g). Smaller particles was densely formed on the surface of the Ti film deposited with 90 W of DC power, as shown in Fig. 2(h), indicating the dependence of the Ti film morphology on DC power. Figure 3 shows cross-sectional SEM images of Ti films on FTO substrates deposited at 90W of DC power with 40 sccm of Ar and a working distance of 2 cm. For a deposition time of 2 h, the thickness of the Ti film was approximately 2.1 μm, as seen in Fig. 3(a). When the deposition duration was increased to 4 h, the thickness of the Ti film increased to 4.4 μm, as shown in Fig. 3(b). Figure 3(c) shows that thickness increased to 10.4 μm when the Ti film was deposited for 8 h. As shown in Fig. 3(d), the deposition rate of the Ti film was calculated to have a slope of 1.4 with an intercept of −0.9. The Ti film deposited on FTO by an Ar flow of 40 sccm with a working distance of 2.0 cm at 90 W of DC power for 8 h was electrochemically anodized to produce nanotube arrays, as shown in Fig. 4. Ti4+ on the Ti metal film was dissolved by NH4F in ethylene glycol electrolyte. Because this dissolution reaction depends on the mobility of fluoride ions in the dielectric constant of the electrolyte solution, the electrolyte composition, external bias, and reaction time for anodization were adjusted. Figure 4(a) shows a photograph of an as-anodized film on FTO, and Fig. 4(b) presents a typical top-view SEM image. The typical SEM image indicates that nanotube arrays with pore sizes of approximately 100 nm were clearly formed after anodization at 45 V. Figure 4(c) and 4(d) show typical cross-sectional SEM images of the anodized film, indicating widely spaced nanotube arrays with pore sizes of 100 nm. Figure 5 shows a comparison of the typical XRD patterns of as-deposited Ti films and as-anodized TiO2 nanotube arrays. Before Ti deposition by RF sputtering, the XRD pattern of the transparent substrate shows a typical cassiterite SnO2 structure. The 2θ peaks of the (101), (200), and (211) planes in the XRD pattern of SnO2 were positioned at 33.8, 37.9, and 51.7°, respectively, as demonstrated in Fig. 5. After 2 h of deposition of Ti metal, the peaks of SnO2 were weaker compared with that of the substrate. As the deposition time increased, the typical peaks of the FTO substrate gradually broadened. This result indicates that amorphous Ti metal film was deposited as the thickness increased. After anodization and heat-treatment, the main typical peaks of anatase-phase TiO2 appeared for the (004), (112), (200), and (105) planes. The 2θ peaks for the (004), (112), (200), (105), and (211) planes were positioned at 37.8, 38.5, 48.0, 53.9, and 55.0°, respectively, as seen in Fig. 5. The XRD pattern of TiO2 diffractions was well-indexed to anatase-phase TiO2 (JCPDS card. #211272) [4,5]. 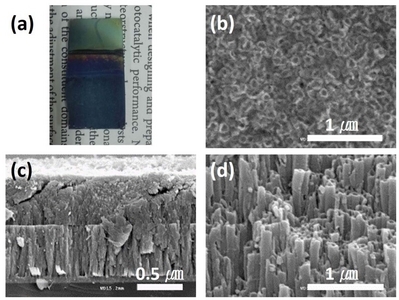 Figure 6 shows the photoelectrochemical characteristics of nanotube arrays with thicknesses of 4.4 and 10.4 μm, produced by anodizing Ti films on FTO deposited 4 and 8 h, respectively. Because semiconducting TiO2 typically shows n-type characteristics, the cathodic current of p-type characteristics was not observed in Fig. 6. Under 1-sun illumination on the backside of the nanotube arrays, the photocurrent density of both nanotube arrays increased with increasing positive potential. The photocurrent density of the nanotube film with a thickness of 4.4 μm was determined to be 13 μA/cm2 at 1.0 V (Ag/AgCl), while the maximum anodic current was 25 μA/cm2 at 1.0 V (Ag/AgCl) for nanotube arrays with a thickness of 10.4 μm. This result indicates that the photocurrent density of nanotube arrays with a thickness of 10.4 μm is twice that of nanotube arrays with a thickness of 10.4 μm under 1-sun illumination. 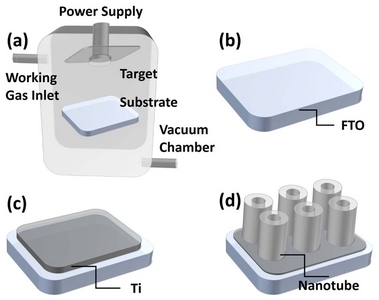 In this work, a two-step approach was utilized to fabricate TiO2 nanotube arrays on transparent substrates. After the formation of Ti metal by RF sputtering, n-type semiconducting TiO2 nanotube arrays were prepared by electrochemical anodization. Compared with the generation of photocurrent by front illumination in typical nanotube arrays on an opaque substrate, this approach allows the production of photocurrent by back illumination on a transparent substrate. It is expected that this work will provide information on the formation of nanotube arrays with various metals deposited by RF sputtering and electrochemical anodization. Fig. 1. Fabrication of TiO2 nanotube arrays on transparent FTO substrates by RF sputtering and electrochemical anodization. Fig. 2. Typical SEM images of Ti film on transparent FTO substrate produced by RF sputtering, where the working distance was 1.5 (a), 1.8 (b), and 2.0 cm (c). Ti film deposited under Ar flow of 42.5 (d) and 45.0 sccm (e). Ti film deposited at 75 (f), 80 (g), and 90 W (h) of DC power. White scale bar is 5 μm. Fig. 3. 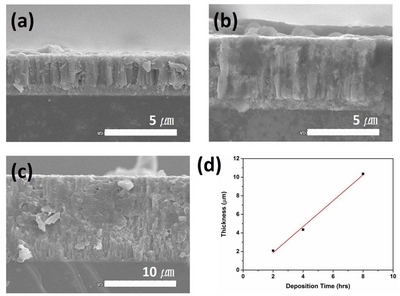 Typical SEM images of Ti film on FTO substrate deposited at 90 W of DC power with 40 sccm of Ar flow and working distance of 2 cm for 2 (a), 4 (b), and 8 h (c), and their deposition rate (d). Fig. 4. 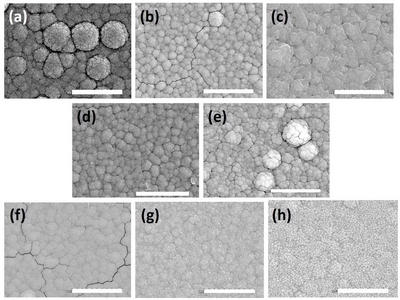 Photograph (a), top-view SEM image (b), and cross-sectional SEM images (c, d) of as-anodized film from . Fig. 5. Comparison of typical XRD patterns of Ti films with various deposition times and heat-treated nanotube arrays. Fig. 6. Comparison of I–V curves for nanotube arrays with thicknesses of 4.4 and 10.4 μm. Seo, H, and Kim, J (2018). Appl Sci Converg Technol. 27, 61. Sheng, T, Xu, Y, Jiang, Y, Huang, L, Tian, N, Zhou, Z, Broadwell, I, and Sun, S (2016). Acc Chem Res. 49, 2569. Bai, S, Wang, L, Li, Z, and Xiong, Y (2017). Adv Sci. 4, 1600216. Jeon, B, and Kim, YK (2015). Appl Sci Converg Technol. 24, 96. Seo, HH, Boo, JH, Jang, HW, Kim, MJ, and Boo, J (2016). Appl Sci Converg Technol. 25, 162. Law, M, Greene, LE, Johnson, JC, Saykally, R, and Yang, P (2005). Nat Mater. 4, 455. Zhu, K, Neale, NR, Miedaner, A, and Frank, AJ (2007). Nano Lett. 7, 69. Mor, GK, Shankar, K, Paulose, M, Varghese, OK, and Grimes, CA (2006). Nano Lett. 6, 215. Ge, M, Li, Q, Cao, C, Huang, J, Li, S, Zhang, S, Chen, Z, Zhang, K, Al-Deyab, SS, and Lai, Y (2017). Adv Sci. 4, 1600152. Kim, HS (2018). Appl Sci Converg Technol. 27, 1.